WEEKLY DIGEST: A TURN UP FOR THE BOOKS! A pertinent title for this week’s Weekly Digest, an expression which today simply means a surprise or unexpected event, but which was originally coined for the bookmakers receiving a shock. A prime example of that was the UK electorate’s decision on Thursday to leave the European Union (EU), going against the momentum of the polls, the markets and implication of the bookmakers’ odds (which had moved from a c.60% chance of Remain in the week before the poll to c.80% on the eve). I have to confess to a certain schadenfreude as your guest author this week; just as your regular correspondent Mr Wyn-Evans enjoys a well-earned break, hoping to have written his last Brexit-themed Digest, he will return to be faced with many weeks’/months’/years’ worth of material as the actual ramifications of the decision play out. Before we examine the implications, a reminder of the immediate market reaction to the decision: UK Equities were 3.8% lower on Friday, a remarkably measured reaction under the circumstances, especially when compared to the German DAX (off 7%), French CAC (off 8%) and indices in peripheral Europe (off c.12%). Why? As one colleague neatly put it, the UK now has relative certainty, inasmuch we have fired the starting gun on the exit process, whilst there is now a bigger cloud of uncertainty hanging over the Eurozone. The pound weakened by c.10% from its intraday highs of $1.50 and government bond prices gained sharply as investors rushed for safety. 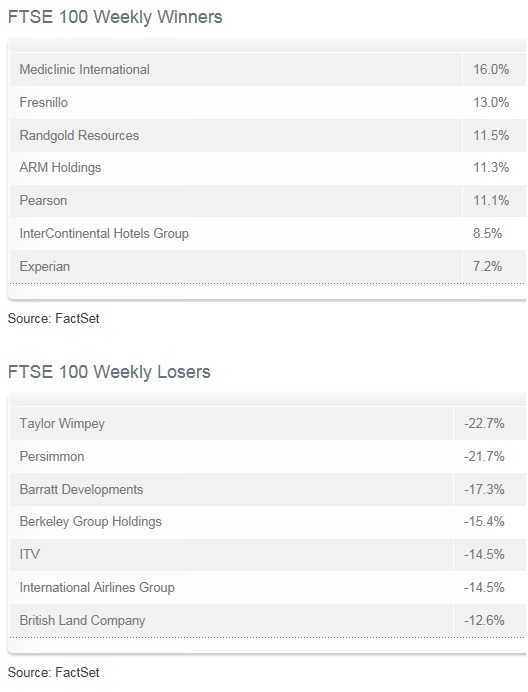 Within the UK’s equity performance, the FTSE 100, home of the UK’s largest companies, fell 3.1% whilst the FTSE 250 fell 7.2%, the latter being more exposed to a domestic UK economy which looks set for some volatility ahead. The abrupt fall amongst the larger market cap names masks the fact that more than 1 in 4 of the FTSE 100 constituents were up on the day (27 to be precise), mostly defensive names which generate a significant proportion of their revenues overseas – just the kind of businesses that we fundamentally like. Sterling, having crested $1.50 on Thursday swiftly moved to a multi-decade low of $1.36 and was weaker against all major trading partners, meaning that a UK company which was down 5% in pounds and pence was nearly 15% cheaper to investors with dollars to spend; cue some bargain hunting by overseas investors. It would be encouraging, though bold on the behalf of the buyer, if this bargain hunting translated into full-blown mergers and acquisitions (M&A). And so, what next? From a practical portfolio perspective, having taken steps in the run up to the referendum to increase ‘insurance’ within our asset allocation, we would love to be lining up a list of ‘babies thrown out with the bathwater’ to go out and buy. Frustratingly, the market has proved a pretty fair discriminator of where the risks and safe havens lie, the latter having held up well whilst we will probably let the dust settle before sifting through the basket of companies with an “at least 10% off” sale sticker on them. From a UK policy perspective, the honest answer is that we’re not really sure. Before we even decide when to implement Article 50 and begin the process of leaving the EU, we have to decide who actually is going to make that decision. We have a political vacuum at the top of the Conservative party, and look likely to have one at the top of the Labour party given the weekend’s swathe of resignations. We have economic uncertainty, including: i) How much will domestic consumer and corporate spending slow? 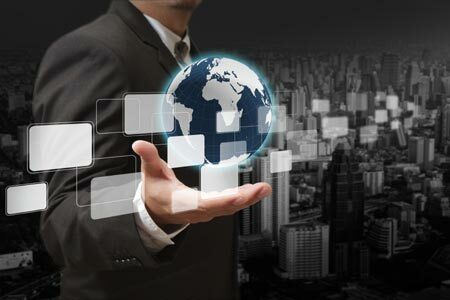 Will inward investment grind to a halt? What will this do for Gross Domestic Product (GDP) growth? Will the Bank of England (BoE) ease rates further to stimulate? ii) Conflictingly, inflation would be expected to rise following the pound’s weakness, so does the BoE increase rates to ward this off and support sterling, but then risk undermining the housing market? Amidst all this uncertainty we can take some comfort; we have an investment process which is dynamic, which had already taken steps this year to de-risk asset allocation and will meet this week to reassess the lie of the land. Within our preferred equities we have a focus on quality, which comes to the fore in such periods of uncertainty. Finally, the weakness in the pound has meant that for a sterling investor, the impact on portfolios has been significantly moderated by the increase in value of non-sterling assets. It’s been a hectic few days in financial markets, with the madness of Friday (24 June) and Monday (27 June) followed by a day of relative calm as key asset prices staged a recovery on hopes that central banks will act decisively to minimise the fallout. Will it last? With so much uncertainty about the next steps for the UK, one should not rule out further volatility. In this brief note we look at some of the more striking price moves of the last few days. 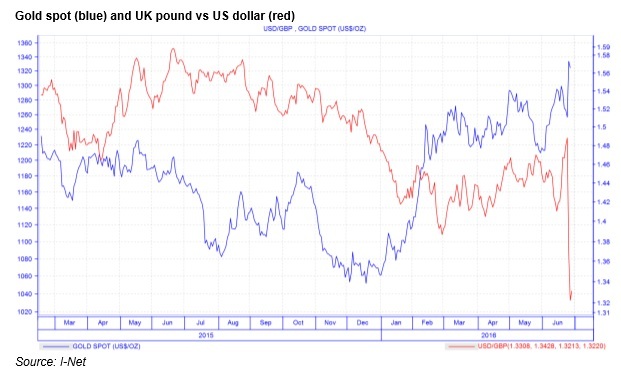 Our first shows the performance of the British pound and how it plunged to 1985 levels against the US dollar on Friday and Monday, while gold showed its safe haven attractions with a sharp rise. 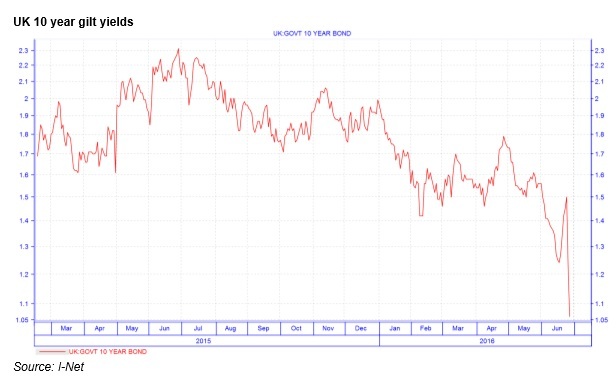 Our second shows UK 10 year yields. Interestingly, UK yields fell by the most over two days since 2009, reflecting the internal flight to safety and expectations that the Bank of England will cut rates in response to the Brexit vote and the likely recession that should now follow. At one stage UK 10 year gilts were trading at 0.93%. It was a different story for Italian bonds, however. 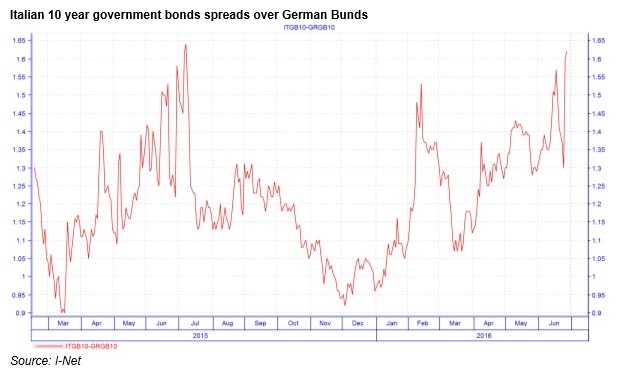 As our next chart shows, the spread over German Bunds widened shot up on the Brexit news. Italy is seen by many economists as one of the likelier candidates to come under pressure from its electorate to exit the European Union. Italy hosts a constitutional referendum in October that are designed to pave the way for key structural reforms. However anti-establishment parties could scupper these plans and increase calls for a referendum on EU membership. While most commentators still see an “Italeave” as unlikely the risks are still there. With the rally in markets going into its third day (30 June) after two days of heavy selling on the news of the Brexit vote, it’s a good opportunity to run the rule over some of the moves in different markets. 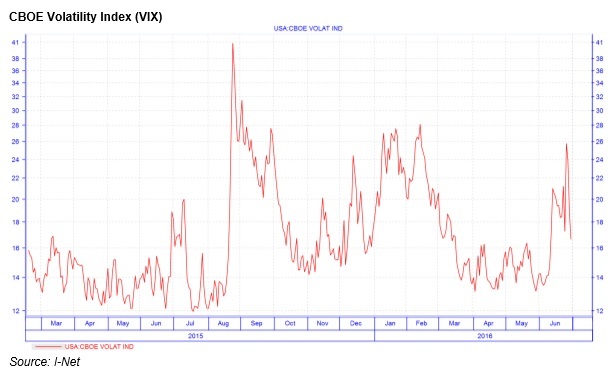 First, we look at the CBOE Volatility Index, or VIX, often regarded as the “fear” index for the way it gauges market moods. High numbers reveal market anxiety, while low numbers show calm. The shock of UK voters opting to leave the European Union (EU) certainly caused a major spike in the index, before coming back as markets rallied. What’s interesting to note however is that the spike in the VIX is a little below levels seen during the market sell-off in January this year. And it is significantly lower than the levels it hit in August last year, when the Chinese yuan devaluation spooked markets and sent the VIX soaring. The implication then is that central bank assurances and the hope that the UK and EU will act sensibly in their negotiations are doing enough to restore normality to markets. However markets have got it wrong before – as we saw in the build-up to the UK referendum. 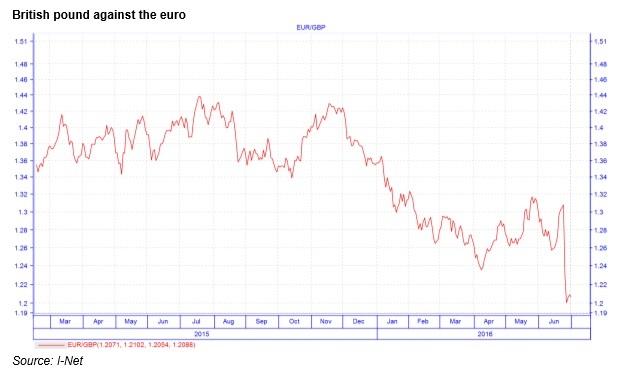 The next chart shows the British pound, the clear loser in the turmoil of the referendum result, against the euro. While it has stabilised, it is still significantly weaker than it was beforehand. A weak pound offers some benefits for the UK as it faces a likely recession next year. Exports should become more competitive, especially to the rest of the EU, its main trading partner. This perhaps explains why UK shares have managed to pretty much recover their losses over the last two days, as our next chart shows. 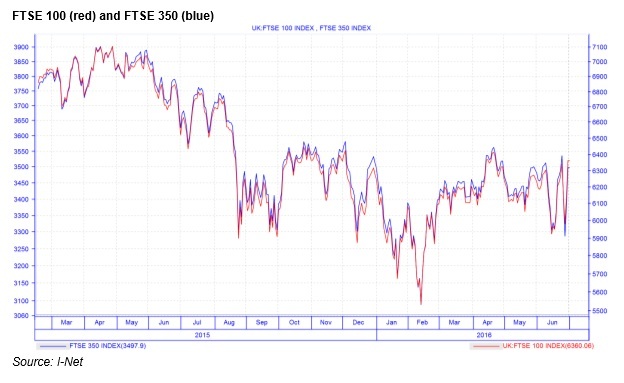 Both the FTSE 100 and the broader FTSE 350 have bounced back and are not terribly far off their highs of the year so far.